As the holidays role around, lots of families and friends are coming together to enjoy large Thanksgiving feasts. During this time, food-borne illness also becomes of larger concern. Families are prepping, cooking and baking copious amounts of food for their guests allowing for more places for food-borne pathogens to arise. The farmer’s market is a wonderful place to buy fresh produce, meats, and cheeses for your holiday meals. Buying food directly from the source limits the steps between the fruit or vegetable being picked to it being bought by you. This helps to prevent possible contamination that could cause a food-borne illness. Similarly, if an outbreak were to occur, it would be much simpler to find the source of the food-borne illness, compared to when food is bought in large grocery stores with hundreds of suppliers. However, preventing food-borne illness is not only the farmer and supplier’s responsibility. And, some bacteria cannot be prevented from contaminating food even with safe farming practices. 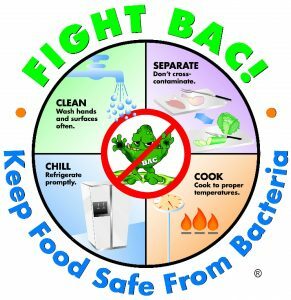 Once you bring the food into your home it is important that you practice safe handling, cooking and storing methods to keep your food free of pathogens. Clean: Wash your hands, cooking surfaces and utensils often. Make sure you are washing your hands before and after preparing or eating food, after contact with animals, and after using the restroom. When your first bring home your fruits and vegetables from the farmers market, give them a good wash and scrub. This helps to remove any bacteria on the surface of the produce. You should even be rinsing off fruits and vegetables that you peel the skin off of, since when you begin to cut into the produce the bacteria on the skin’s surface can make its way into the portion you eat. DO NOT wash your meat and poultry items. The splashes of water can contaminate your cooking and prepping surfaces. Separate: Do not cross contaminate surfaces and cookware. This means you should be using a separate cutting board for fresh produce and raw meats. If you do choose to use the same cutting board, make sure you give the board a scrub with hot water and dish soap in between uses. The same rules apply to using the same cooking utensils for raw meat and fresh produce. Cook: Make sure you are cooking all raw meats, poultry and eggs to the proper temperature. Temperatures from 40°F -140°F are considered the danger zone for foods that are intended to be refrigerated or kept hot. So, when you are thawing out that large turkey in the days leading up to Thanksgiving you should not leave it out on the counter or outside. The best way to thaw a frozen turkey is to leave it in the refrigerator. Turkeys should also be cooked to an internal temperature of 165°F, with the oven set to a temperature of 325°F or higher. The best way to determine this is using a thermometer placed in the thickest part of the turkey, typically one of the thighs. There are also time guidelines for cooking turkeys based on their size. Chill: Refrigerate leftovers promptly. Leftover food should not be left at room temperature for longer than 2 hours. This length or time is shortened even more in hot and humid weather. All leftovers should also be eaten within 4 days from when they were cooked. If you do not think you will be able to eat the food within 4 days, freezing some your leftover is a good idea to prevent unnecessary food waste. I hope you all have a happy and food-safe Thanksgiving! Sofia’s Post: Thankful for Leftovers!